When parents take their young children to crowded places, they hold hands to help keep the kiddos safe. That’s not a new strategy, though. 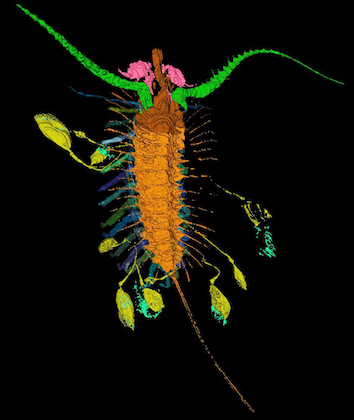 A tiny marine organism was doing the same thing 430 million years ago. Scientists found the fossilized organism at the bottom of an ancient sea in England. The creature was an arthropod -- the group of critters that includes insects, crabs, and shrimp. It was about a centimeter long, with a segmented body covered by a hard shell. It used about a dozen pairs of legs to crawl along the sea floor, and long antennas to feel out possible prey. The name also honored the 2003 novel “The Kite Runner.” The scientists considered that the hangers-on might be parasites or hitchhikers. But they concluded that they were offspring instead. They most likely were attached to the parent for protection. The juveniles probably behaved a bit like tiny kites. As the parent -- no one knows if it was mother or father -- crawled along the bottom, the little ones may have sailed above and behind. And they may have used their appendages to filter microscopic organisms from the water. No other arthropods have ever been known to have their young tethered to them. So Aquilonifer was ahead of its time -- holding onto its young ones to keep them safe.